The scene that followed it is impossible to describe. The hapless passengers of the forward cars were, almost inextricably mingled in the shattered mass. The engineer of the second engine was instantly killed, and the fireman seriously injured. Out of the first car only four persons were rescued alive, and they were badly hurt, all being crushed by the second car, the bottom of which rested along the tops of the seats of the first. The third was piled upon the second. The next three were smashed and splintered, and most of their occupants were among the wounded. To add to the midnight horror, the flames were making their way in the shattered debris, and there was no water at hand. After a long contest the fire was extinguished, mainly by smothering it with dirt, which had to be dug up with the hands or any improvised implement that could be seized. 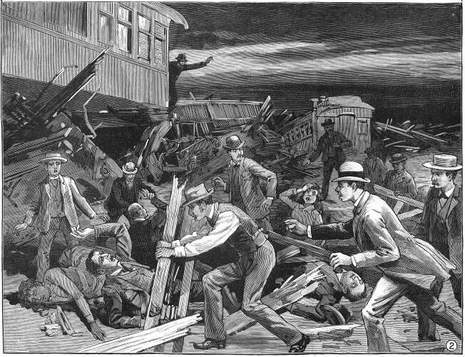 While this was going on amid the shrieks of the injured victims and the terrors of those who escaped, every effort was made to extricate the dead, the dying, and the wounded. Help was summoned from the nearest towns along the road—Gilman, Piper City, and Chatsworth, and most of the dead and helplessly injured were sent to the latter place, where the Town-hall was turned into a hospital and the railroad station into a morgue. The number of the killed and injured is not definitely known. An official estimate gives the former as 16, and the latter 279. 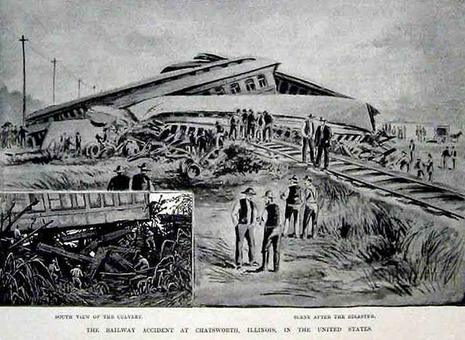 The 1887 Great Chatsworth train wreck was a major rail accident that occurred late on the night of August 10, 1887, 3 miles (5 km) east of the town of Chatsworth, Illinois, in the United States. 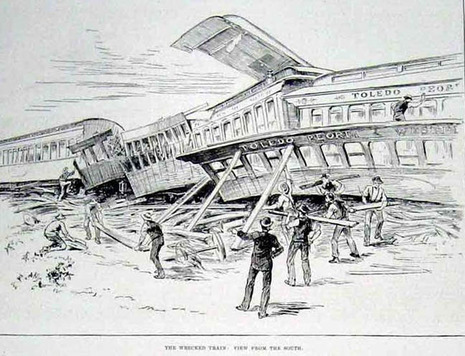 A Toledo, Peoria and Western Railroad (TP&W) train bound for Niagara Falls from Peoria crossed over a trestle, weakened earlier in the day by a fire, causing it to collapse. Between 81 and 85 people were killed, and between 169 and 372 injured. The section hands at the coroner's inquest in Chatsworth have revealed the whole story. They set the grass on fire and then went away and left it. The fire crept up to the end of the trestle works where there were a lot of old ties piled up to support the embankment. There were like punk and they smouldered away undermining the track. It also appears that this was done on the east end of trestle and that the adjoining timbers had burned down until they were all charred. 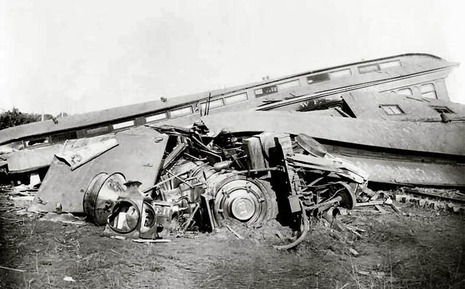 As soon as the train struck this the first engine passed over all right, but the next went down and the wreck followed. It is inconceivable that some one of the section men did not have sense enough to go down there and attend to it, particularly when they knew that there had been fire so close to the trestle. They seem to have acted in the usual way, that when six o'clock came their responsibility ended. Outsiders looked down the track and saw a light and wondered at it, but the railroad men with that lordly indifference that characterizes most railway officials paid no attention to it, and the train was allowed to go on to its own destruction. This seems to be the story as reluctantly told by the section men. It carries its own comment. We have often said that if an individual carried on his business with the same slackness, indifference to his customers, insolence and general carelessness that a railroad manifests he would fail in less than a month. Nothing but the fact that railroads are virtual monopolies and the public are "forced to patronize them" enables them to live at all. This sort of policy has cursed the T., P. & W. management ever since it was first built. It was constructed at a time when railroads were new, and it might have been a great trunk line. Its officials unhappily conceived the idea that their policy was to bully and browbeat the public and to disoblige its customers as much as possible. The policy of doing as little as possible seemed to animate everybody, from the highest official down to the lowest section hand. The present management have striven against it, and done the best they could, but this neglect and devil take --- the-hind-most-style, shows that the old spirit had sunk too deeply into the road to be easily eradicated.